In our hair and beauty salon in Prague we work exclusively with L’OREAL PROFESSIONAL and KERASTASE products. Our professional hairdressers and stylists know how to create haircut, highlights, hair colour, hairstyles in line with the latest trends. We also offer hair for wedding events (incl. bridal hair). If you have party or evening in Prague, we will style you hair to underline your beauty. Professional level our hairdressers is supported by status of Golden salon Expert from L'OREAL Professional! BeautyShape hairdressing division was awarded “Golden salon Expert” by L’OREAL Professional. All our hairdressers go through structured education programs and keep in touch with key members of L’OREAL Professional team. That gives to our clients a guarantee of top quality services and 100% original products, using the latest trends and technology in hair care. Try HAIR CONTOURING. Hit 2016-2017! Contouring will boost your beauty features! Contouring is a new method of highlights, which allows to hide our disadvantages and underline our beauty features. How Hair countouring works in hairdressing? Hair Contouring is a revolutionary colour application technique which creates optical illusion. The technique uses the careful placement of colours around the face (by hand) and, thanks to the light and shadow, can change the appearance of your face shape by highlighting your features and boost your natural skin tone without any kind of make-up. Darker tones create shadows, which are used to narrow the face shape. On the other hand, light tones lengthen the face by reflecting more light. Our stylist will without a doubt help to create the illusion of the desired shape of the face, depending on what you want to emphasise. Gifts for our clients! Only this month - special PROMO . Book any coloring service and you will get a present from us - makeup cosmetics! As the first salon on Prague 2, we offer haircut using so called “hot scissors”. The hot scissors have special electrically heated blades, which seal hair ends during haircutting. Using the hot scissors you prevent split ends, hair becomes healthier, hair gets natural shine and flexibility. Unlike traditional scissors, which open the cuticle and leave the hair susceptible to environmental stress that can cause frizz and dryness, the heat from the hot scissors seals the end of the hair so natural moisture is kept in hair fiber in order to preserve its maximum qualities and regeneration power. Effect is guaranteed and haircut shape stays for much longer. You are visiting BeautyShape for hairdressing services? Only now we offer a 20% discount for any facial cosmetic treatment from Best European Spa Cosmetic — Comfort Zone, if booked together with any hairdressing service at the same visit. Make yourself a complete beauty day duiring your visit to BeautyShape! Please, book yourself in in advance by phone 773 034747 or online. Ombre - this new trend is actually a very low maintenance style in regards to keeping up with your roots, but still getting a pop of color. It’s been spotted on plenty of A-list celebrities: Drew Barrymore, Jennifer Lopez, Sandra Bullock, Sarah Jessica Parker, Mila Kunis and others. What is Ombre hair color? The hair world borrowed the term ‘Ombre’ from the french word meaning shaded or shading. Ombre hair refers to hair color fading from dark to light, or vice versa. Instead of the color starting from the roots, it gradually becomes lighter, or darker, towards the ends. You can make an appointment to go ombré by phone 773 034747 or online. Due to anodised ceramic floating plates which deliver a continuous flow of high-pressured steam, Pro-Keratin, which is applied to your hair before treatment, penetrates your hair cuticle. This results in sleeker, smoother hair until your next 3d wash. Combing the power of steam and Pro-Keratin technology, the SteamPod allows stylists to reveal visibly repaired, strengthened and hydrated hair, exceptional smoothness, unparalleled shine, long-lasting results and a superior blow-dry finish. You can book SteamStyle treatment by phone 773 034747 or online. PINK, VIOLET, BLUE, GARDEN, CORAL, BRONZE BEACH, COFEE and BLACK. Hair Chalk makes changing your look every weekend as easy as changing your shoes. Innovation! Olaplex: Hair Color’s Holy Grail – now exclusively at Beautyshape Center! Olaplex is a hot-new hair repair treatment that can be mixed in with coloring products to minimize damage. With this new salon wonder-treatment you can color your hair more often, go lighter and double process the same day without any fear of breakage! Olaplex is an additive that eliminates the bad reaction oxygen has with broken sulfite bonds in chemically treated hair that leads to breakage. Especially beneficial for chemically colored hair, it has the potential to restore the health of all damaged hair types given that hair bonds are broken during thermal, mechanical and chemical services. It pretty much guarantees that your locks will feel softer and look stronger! 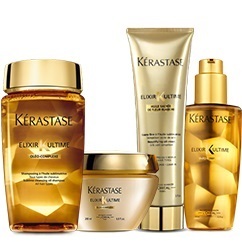 Buy professional products by Kérastase online! Special Offer! Get 15% back on every purchase above 1 000 CZK! Visit our e-shop salon boutique. Looking for a nice present to your friends or family members? Make a beautiful present by purchasing a gift voucher to BeautyShape center in Prague. In our beauty and hairdresser salon BeautyShape, clients can try more than 100 professional beauty treatments! If you are not sure what is the best for you, you can book a free consultation with our hairstylist.